This episode of “The Transmission” takes a look at the thirteenth episode of Season 5, “Some Like It Hoth.” We recap the story in under eight minutes, then spend some time discussing it in greater depth. Then, we turn it over to You All Everybody, our brilliant listeners and readers. Then, in the Forward Cabin, we take a quick look at upcoming episodes. Check out Jim (a.k.a. 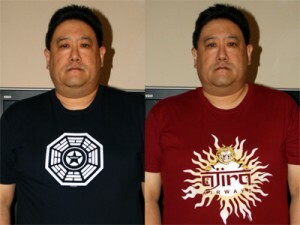 @jwatari) and his official “LOST” T-shirts! (He bought four different styles!) Get yours! This entry was posted on Friday, April 17th, 2009 at 11:48 pm	and is filed under Podcast. You can follow any responses to this entry through the RSS 2.0 feed. You can leave a response, or trackback from your own site. I loved how they tied Hurley & Miles together with their “daddy issues” and their ability to communicate with the dead. Ryan and Jen: Just got done listening to the podcast. Great job as always and am not looking forward May 14, the day that begins the long hiatus not only from Lost, but from the Ozawas and you all everybody as well. Two thoughts after listening to the podcast. First, you commented that Ms. Hawking is part of the DI. I always thought that she was a Hostile and therefore an enemy of the DI, based on the episode when she and Widmore are togther in 1954, and later the comment by Alpert about not answering to her and Widmore. The fact that she has access to The Lampost DI station only proves that the Hostiles were able to take over and commandeer all the DI stations after the purge and steal their research and technology. Of course it could be that Widmore and Hawking were early Dharma pioneers, who upon reaching the Island in 1954 met up with the Hostiles. Widmore decided to put in with Alpert and the Hostiles while Elllie eventually sided with the DI and left the Island at some point. We shall see. Second, after first thinking that Elena is a Widmore mole, I have now been swayed by all the blog comment that she does have some connection to Ben and possible a reconstituted DI. Now Bram is on the Ben team too. I have always been curious about why Ben and now Bram are so confident that they are the good guys and that their side is going to win. Ben has stated numerous times that he is one of the “good guys” and now Bram confidently tells Miles that they are the side that is going to “win”. Why such bravado? We certainly don’t hear it from anyone else. So this summer’s Dharma ARG ties in to this season, but the other year’s didn’t always – especially season one’s with Rachel and the Hanso Foundation. I’m still waiting to see what Hanso and the earlier ARGs have to tie in to this – will the DeGroots finally make an appearance (in Dharma, off the Sub with Daniel, or in the Dharma pit?). In the ‘Dharma Pit’ when Locke & Ben visit, the camera pans to a skull that had what I thought was a bullet hole in it – now I think it’s the ‘dental accident’ from this episode. So… that brings me to question the Pit itself. Is what we saw from Ben’s flashbacks true? Or did the Dharma Initiative initiate the Pit in the beginning (ie: not bury the dead, but mass grave them with this guy?). However, he is on top. But I have always questioned Ben’s story ever since I saw that bullet hole during the slow pan. I’m waiting for Miles to find the pit. Can he talk to skeletons too, or do they have to be just passed on? He can surely bring some insight to the whole thing. Great podcast – keep it up! I keep hearing about this Atlantis theory over and over again, but I can’t agree with that as an explanation for the island. But then again my own theory sounds even more ridiculous. Okay whenever I say this I get some laughs but the more I think about it the more it makes sense. Theory: The Island is a Gigantic Alien Spacecraft! Crazy right? But what if such a spacecraft crashed on earth millions of years ago and was slowly covered with layers of earth. But perhaps parts of the ship could still be functional (i.e a defense system: smokemonster, onboard computers: anyone who died and seemingly came back to life). But then to complicate the matter, other inhabitants have lived on the island, exploiting parts of the ship (like the navigation system or donkey wheel). Connie in Alaska stole my first thunder. She’s right on the money that we haven’t seen Ms. Hawking explicitly with the DI, but we have seen her as a member of the others. And her occupation of the lamp post may only prove that the others have commandeered DI assets. We know for sure that the Others have taken over the sub. The supply drop still remains a great mystery to me. An others’ operation or advance provisions for an invasion was force was what I asked many weeks ago on the blog. And what certain spirit was found in the “Everyone Hates Hugo” drop? McCutcheon’s whiskey. Don’t count out Charles Widmore. On the debate about the process of Miles’ gift, everyone brings up the “Confirmed Dead” scene in which Miles appears to engage in a conversation with the spirit of the boy. But what about what happened in this episode? Miles the child tells his mother, “he’s still talking.” This sounds more like a sentient voice speaking to him than just picking up the vibrations of the past. Rich I would add: Widmore’s pragnancy test! So yes maybe Hawkin and Widmore were planing on finding the Island and maybe come back… But I don’t understand why the food would arrive 3years before their coming. Connie: According to the orientation’s film (and especially the swan one which was the most ellaborate one… but the people working there being trapped and sealed I guess the video was their only way of information so it had to be the most ellaborate) the Dharma Project was created in 1970 by the DeGroots (and for those asking when we will see them in the show I remember they were played by production assistant… not actors!). So Hawkin and Widmore can’y be part of that in 70… the Island has been discovered by the army in the 50s and then the D.I. found out about it latter. My last post just made me realise… The DeGroots are FAKE!!!!!! Just as Marvin Candle, Mark Wickmund and Halliwax!!! Pierre Chang IS the Dharma boss! That’s why he is so secret about his name in the video! If Pierre Chang knows that their all going to die (aka the comicon video) maybe he retape all the videos with different name so that the others couldn’t find him after the purge sending them on the lookout for the DeGroots and keeping at least his family safe! And even maybe he is still alive! Just some thoughts about the fake 815 crash footage. Ben claims that Widmore did the fakery. Widmore claims that Ben is responsible. What if they’re both telling the truth about not being the responsible party? What if it’s Ilana’s group who did it? Could explain why both think it’s the other. but aren’t the DeGroots seen in a Dharma vid? I can’t forget..
love the podcast, of course, but no talk of Sawyer and Phil? How’s Sawyer gonna get out of that? he could kill him, put him in the forest and blame the others, but that doesn’t seem like Sawyer – either the new OR the old Sawyer.. so what will end up happening, I wonder? and what has Daniel been doing off-island? I am going to assume that he left via submarine, as we don’t know of another way off besides boat, and the FDW. It’s just hit me – I will bet anything that Dan has come back with a big scheme on how to break the ‘whatever happened happened’ rule (which is why he’s looking so confident – he thinks he’s going to save Charlotte) and the incident will be him failing to do it. My guess is he’d die in the process. We will see! My only problem is the Room 23. We can see DeGroots and Hanso in it. But my real problem is: why broadcast a DHARMA video to an Other? And why would a Dharma vid would have “God loves you as he lovED Jacob”. Q. What lies in the shadow of the statue ? A. The Darkness of Time. The people who use it are from Dharma so it’s not a straight answer like an entrance to the Temple or whatever but a symbol. Darkness, kind of obvious, it’s dark in a shadow. Missed your podcast this week (unfortunately – going to listen to it here on the website) but I’ve been thinking about something Miles said/did in Some Like It Hoth. He basically told the football players father that having the body would be better for his powers. Yet – in season four – the only flashback of Miles (during which he visits the grandmother and gets the money out of the wall) where he uses his power, there is no body. Is this an continuity error, or are they implying that he can communicate even when a body is not present? (he did say to the grandmother that is wasn’t as hard as he thought when he returned the extra money). @Tim R: I don’t think Daniel will die, seeing as how we saw him last season at the beginning of the episode, staring at the “uncovered” Oceanic 815 sitting in the bottom of the ocean. This is, perhaps, a strange and way off observation of sorts, but I got to wondering about something. You know how Aaron wasn’t really Kate’s child, and yet she raised him nonetheless? And you know how Alex wasn’t Ben’s daughter, and yet he raised her nonetheless? And you know how the kids on the island are apparently “taken” by Ben and “the good guys” in order to be raised? And you know how Richard sort of takes mini-Ben so that he might be raised by The Hostiles? And you know how Locke wasn’t raised by his birth-mother? And you know how Sawyer wasn’t raised by his parents, either? Well, what if Roger isn’t really Ben’s father? I mean, I’m not even exactly sure why I think this, but for some reason I started to think it could be the case. His resenting Ben for the death of his wife is one thing, but what if he also resented Ben because, well, she was pregnant with someone else’s baby? And what if — and this is a BIG what if — that man turned out to be someone like, say, Charles Widmore? I mean, at this point we don’t know who he sired a child with off-island, yet we can assume that child was Penny. But what if he impregnated another woman, as well (or even the same woman previously), and we learn that Ben and Penny (similar sounding names, particularly given that Desmond calls her “Pen” sometimes) are actually siblings? Matt-Good point about Miles and the drug dealers ghost. Perhaps he has to be in a place where a ghost is thought to be hanging out. Didn’t the grandma call Miles because she was scared about something going on in her house? The football player’s dad just wanted to contact his son and didn’t say anything about ghostly phenomena happening around his house. Did anyone else think that the dad’s backyard looked like it was in Dharmaville. I think it was the yellow houses. It threw me off for a bit thinking Miles was offering his services to Dharma members…oh, well. Is the taco stand location where Miles was, the same site of the Hoffs Drawler Funeral Home? The Incident is feeling more and more like it has to do with the two Miles and it would also provide a good explanation for Chang losing an arm as he tries to prevent it from happening. I agree with MarkB that the answer to Elena’s question isn’t a ‘real’ answer. It’s just a password. If it were a real answer, like ‘The DI Grave’, then people like Ben would be able to get it right and then the phrase is useless. I can’t get behind the idea that Hawking has taken the Lamp Post from the DI. What’s to stop them taking it back? Finding the island to take it back is tricky, but getting a squatter out of their secret base in LA should be pretty simple. Last night on Coast-to-Coast radio, they were discussing the lost city of Atlantis, time-travel related to Atlantis, and radioactivity related to time travel. Unfortunately, I heard about three words of the broadcast before I fell right back to sleep (it’s an all-night program). But during my three-word listen, I thought, OMG, they’re talking about LOST. You should give a listen! I think you’d find it fascinating. I’ll be listening to the broadcast again, that’s for sure. Look at the left-hand sidebar for archives. Also, the description doesn’t do the actual broadcast justice. Well, not the three words I heard at least. @ Brandon from Harrisburg : Wow – – that’s a crazy idea about Ben & his dad. Anything is possible I guess. @ Matt Murdick : I remember when he visited the grandmother he had some sort of device with him as well…looked like one of those small black & decker vaccums I remember…maybe if the body isn’t present then that device helps him out. I would say that he used it as part of his ‘parlor trick’ except something definitely bumped or moved while he was in that room. Daniel’s crying….I think maybe Daniel will change things so that he thinks that they have been corrected…but will lose memory of it…then when he sees the news that the plane has crashed he will somehow feel like whatever he did didn’t work. ~OR~ EVEN BETTER-~ Maybe the crash this time is for real. Maybe the plane was always meant to crash, yet this time it’s not on the island and it’s not faked. Perhaps that was one of the the final shots of the show? The island is gone and destroyed, the 815ers never land, etc, etc. Much like Donnie Darko I guess. Quick question about the recap ep tonight. I was only half watching, but at the beginning, did they say Widmore planted the fake 815 plane in the ocean? Lorne-I also heard them definitely say that Widmore was the one who faked the plane crash in the ocean…not “supposedly” or “thought to have”. Another thing I noticed that I didn’t before is that when Elouise Hawking is speaking to the group in the Lamppost and explaining what it was for, she refers to the DI as “them”, “they” etc…never including herself i.e. “us”, “we”, so I don’t think she is some new head of the Dharma Initiative. She is most likely the new third party running Elena and Bram as others before me have speculated. Lorne and Connie: We don’t know who faked the plane crash, we just know that the dead guy Miles saw as an “interview” was bringing photos of missing corpses in a cemetary and a purchase order for an old plane. But we don’t know who bought it. Thanks Connie. I knew there was a reason I watch those darn clip/recap episodes. Did anyone else feel that we got a final answer on Penny’s status as well? I can’t recall the precise wording, but the recap seemed to suggest that what we observed was all that happened and that Penny is safe. I was troubled by Ben’s apology, but maybe what he did was bad enough. There’s a new official podcast today, that I haven’t listened to, but in the previous one, D&C said that Desmond did get shot, and we might not have seen the full repurcussions of that yet. Perhaps Ben was apologizing for that as well. Didn’t think about Desmond. But he must be OK if the apology is directed to him. How nice to see Josh Holloway on the cover of this week’s Vancouver Sun TV Times — yum — Get Lost — 100th episode! I’m hoping “The Variable” is a companion piece to “The Constant”, which was one of my favorite episodes! So…who is the “Constant” and who is the “Variable”? In the pairing of Desmond and Daniel, is Desmond the “Constant” and Daniel the “Variable” or vice-versa? We already know that Daniel considers Desmond his Constant, but he also told Des that the rules do not apply to him…he is a variable free agent in time. Hmmm…..looking forward to this episode to find out! Waw! Amazed that the answer to the fake plane is given in a recap!!! Well… Desmon is a constant through space/time continuum. The guy that moved in time are “variable”. Sun is not a variable for exemple. Small easter egg, but did you see that Miles hung the key to the van in ‘Some like it Hoth’ on peg 8 when he was finished with it? Hope no-one else has mentioned this – don’t want to turn the frozen donkey wheel of blogging and get flamed!